Any questions, comments or feedback please do not hesitate to contact me at maggie.deane@edinburgh.gov.uk. Please could you let me have any queries by 30th October to allow time for any amendments and Committee lead in times. Diarmaid Lawlor (Architecture and Design Scotland and Chair of the Commission of Prevention). We asked the panel to give their thoughts on the film and this is what they said. 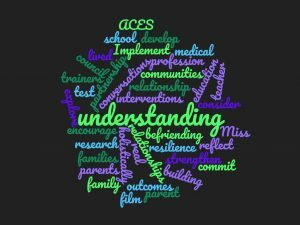 There are no magic bullets to fixing ACES…we need the resources to really make any changes to people’s lives. Let’s not put all the onus on the family we need to remember that there are also the structural and government issues, we need to work on policies and legislation. For example we shouldn’t forget the impact of universal credit, use of food banks has increased 5 fold in areas where it has been rolled out. This film is important because it reminds us that it is valid to consider the long term effects of issues on people’s lives. 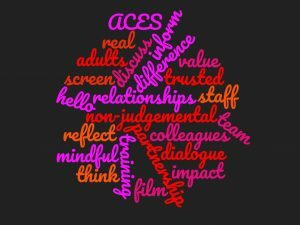 The emotional punch at the first viewing of the film shouldn’t be underestimated, and it is useful to watch it a second time – the use of ACES terminology and this film provides those in position to influence hooks to open doors with the policy makers. We know that it is the little things that make a big difference. 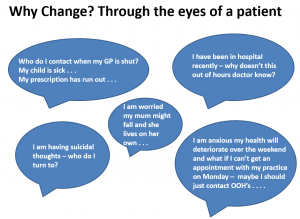 How do we get policy makers to listen to people. Mind the Craic the commission for prevention gives us an opportunity to illustrate this as it develops. The film was well received by the audience and everyone felt they had come away better informed. We asked the audience what they would do as a result of this morning and we have gathered their responses here. A real emphasis on sharing information about the film with colleagues, remembering to be empathetic, some commitment from people to become that trusted person with whom a strong relationship can form and a lot of commitment to bring people’s “own self” into the work they do. A new local development plan for Edinburgh – City Plan 2030 is in development. Following on from meetings with Community Councils in March this year CEC are now holding a series of community engagement events across the city. At the workshops they will be asking for ideas for the new plan, including suggestions for new planning policies and where brownfield sites could be developed. These workshops are taking place in September and details can be found here. Edinburgh’s employability themed participatory budgeting programme has moved into the voting stages and you are invited to attend the voting event in your locality where you can learn more about the employability projects on offer, and vote for those you would like to see become a reality in your locality. Successful projects will be announced on the day and a free community social lunch and refreshments will be provided. Voting is open to anyone over the age of 16 who lives or use services within the locality of the voting event attended. All community members are welcome. Posters are available in PDF or hard copies can be requested by replying to this email. The Scottish Government Democracy Matters Community Engagement Fund provides grants of up to £300 (in exceptional circumstances up to £500) to small voluntary organisations and community groups in Scotland to help them run an event with a group of five or more people to discuss what matters to them in relation to democracy. Deadline to apply is Fri 14th Sept.
Groups and voluntary organisations with a turnover of up to £100,000 can apply for a grant to run an event and cover costs such as venue hire, catering, childcare and inclusive communication such as interpreters. 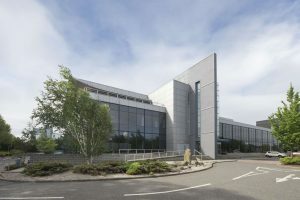 A brief report and evidence of what emerged from the event must be returned directly to the Scottish Government by 31 October 2018. The report can be in a range of formats such as notes from the discussion, a video clip or photographs from flipchart sheets. If a report has not been submitted by the agreed date, you will need to repay the grant. So reads the preview to the film Resilience that is being shown in September in partnership between NHS, Compact Partnership and EVOC. We are looking forward to a healthy debate on views expressed in the film and what we can learn and take from the approaches illustrated. At this moment this screening is fully booked but keep a track of where you can see it (or arrange a screening yourself). We would just encourage you to have the debate too – as there are a number of people who raise criticisms to this approach. Listen to what Professor Jane Callaghan has to say when she voices her concerns about ACES.